Sometimes the bad things that happen in this world and the pain and suffering of so many overshadow the good things that we do have. One of those good things is the music that we can now so freely share and enjoy, music of exceptional quality and enduring artistic value. Never before have so many been able to create and never before has an artist's work been so widely distributed, even to an audience dispersed around the entire planet. 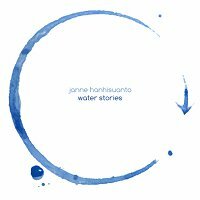 With this in mind, we proudly unveil Water Stories, the latest release by Finnish ambient maestro Janne Hanhisuanto, an outstanding contribution to this rising tide of artistic freedom that has touched us all. Janne's debut Earth Mantra release, Icescapes, was critically acclaimed and very well received, and deservedly so. Janne's skill at crafting sublimely beautiful and mature ambient space music cannot be questioned. But with Water Stories, we feel he has upped the ante yet again, for in our opinion this album is simply a staggering accomplishment. As with his previous work, the music of Water Stories exists somewhere in the crossover realm between ambient music, space music, and mellow new age, taking the best elements of each and fusing them into something altogether refreshing. Perhaps more introspective and slightly melancholy than his previous work, this music nonetheless possesses an almost aching elegance and wistful emotional appeal. While listening, we repeatedly found ourselves with goose bumps, drawn into the narrative of the album, into the water stories being told, immersed totally in the sound stage and sonic world that Janne has created. Anyone who is a fan of space music, light ambience, new age, or even symphonic music will likely find plenty to love about this stunning and delicate release. Thematically, Janne presents a collection of tone poems inspired by water, and indeed his sound design and use of field recordings present this point of view well. We would encourage listeners to free their minds of concrete interpretations, however, as they listen to Water Stories, and instead let the magnificence flow through them unobstructed, like water through the sieve of the consciousness, and let the mind wander freely while the music plays. We would assert that this music is almost cinematic in nature, and would fit as the soundtrack to almost any story of importance. To us, this is the mark of a supreme artistic achievement, one where the listener can adapt the work to fit seamlessly into their own lives, to render a meaning as distinctively personal as each individual who listens. And Janne has achieved this in spades. We at Earth Mantra have occasionally been accused of gushing over the music we release, of perhaps loving the music so much that we describe it in terms more glowing than are deserved. Certainly, the process of describing a release to our audience is an inherently subjective one, and we are indeed passionate about the music we present. But rest assured, there is little possibility for hyperbole when it comes to this exquisite release. Water Stories is without a doubt one of the top ambient releases of 2010, and one that we are exceptionally proud to bring to our audience. Highly, highly recommended. Very good album, I especially enjoyed "The River". Perfection. Wonderful music! Will be adding a few of the new tracks to the Astreaux World station! Some of the best ambient music I have had the pleasure of listening to in a long time. This album is not one to be passed by. Thanks. Quibbles first. The Vangelis influence is (for me) too obvious in places ("Rain Song" and, particularly, "Waterology"). I don't understand what the title "Standing Wave" has to do with the track's music (and I felt several times while it played that I was listening to Harold Budd). Bottom line - the music is very well crafted. The sound selections are excellent, and the production is very good. An easy and pleasant listen. this is really great ambient music, inspired and delicate. Listen first the third track: the perfection. The presentation of this release is in any way exaggerated. A great achievement. Lovely. Very beautiful, delicate sounds, sometimes reminding me nicely of Vangelis. Good stuff, definitely worth checking out.